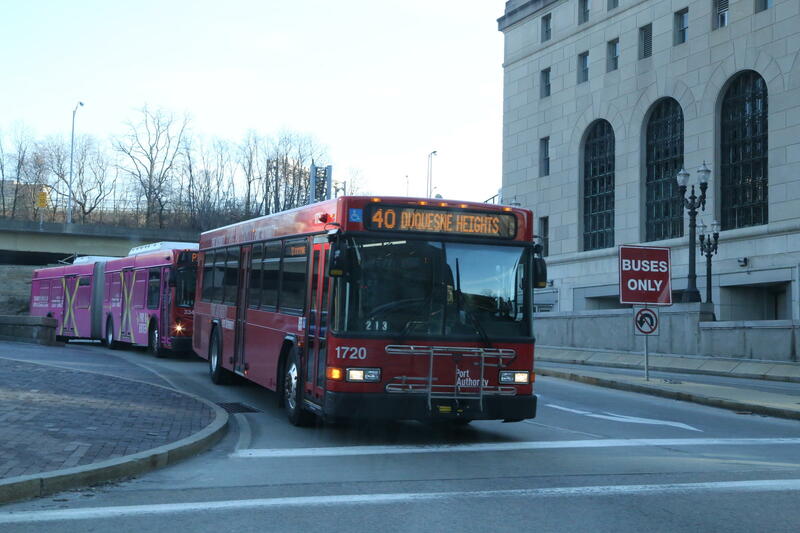 A bus exits the East Busway in downtown Pittsburgh. The study considered seven alternatives and found that two were the most workable, according to a summary obtained by WESA. The study has not yet been publicly released. The first option would extend the East Busway 2.9 miles, from its current terminus in Swissvale along the Norfolk Southern railroad right-of-way to East Pittsburgh. Doing so would allow for bus access to East Pittsburgh and Pitcairn. Buses could travel to Monroeville along local roads or a link to the planned Mon-Fayette Expressway. According to the summary, the 2.9-mile extension is estimated to cost $549 million in 2026 dollars and create an increase of 1,600 daily riders. If the busway were extended just to Braddock, the cost would be $166 million in 2026 dollars, increasing ridership by 800 daily riders. The second option would extend the East Busway by 10 miles, from Swissvale to Monroeville. After traveling through East Pittsburgh and Turtle Creek, the busway would connect to the planned Mon-Fayette Expressway with ramps. Once on the expressway, the buses would use regular lanes instead of dedicated or High Occupancy Vehicle lanes. According to the summary, the 10-mile extension would cost $704 million in 2026 dollars and generate a total of 2,400 daily riders. Extending the East Busway to East Pittsburgh, when combined with an extension of the Mon-Fayette Expressway from Route 51 in Jefferson Hills to I-376 near Monroeville, was projected to create 21,000 long-term jobs in the region by increasing transit access and connectivity, according to a 2016 study from national transportation research group TRIP. The Southwestern Pennsylvania Commission approved the last leg of the Mon-Fayette Expressway in June. Given the price tag projected for extending the East Busway, the summary recommended further study to find cost-effective ways of expanding transit access and mobility in the eastern corridor. Port Authority spokesperson Adam Brandolph said the Port Authority is continuing to review the report. Gannett Fleming did not immediately respond to a request for comment, nor did the Southwestern Pennsylvania Commission. Laura Wiens is director of Pittsburghers for Public Transit (PPT). She has not yet seen the study or the summary, but wondered if the projected ridership numbers took into account the effect transit infrastructure has on driving development. Extending the East Busway is one of the potential projects included in the Southwestern Pennsylvania Commission’s “Mapping the Future: The Southwestern PA Plan,” produced in June of 2015. That document also included the proposed Bus Rapid Transit Project (BRT). The selected BRT route would run buses on dedicated lanes from Downtown to Oakland, and then mingle with other vehicles on their way to Highland Park and Greenfield. BRT will also connect to the Martin Luther King Jr. East Busway in Wilkinsburg. 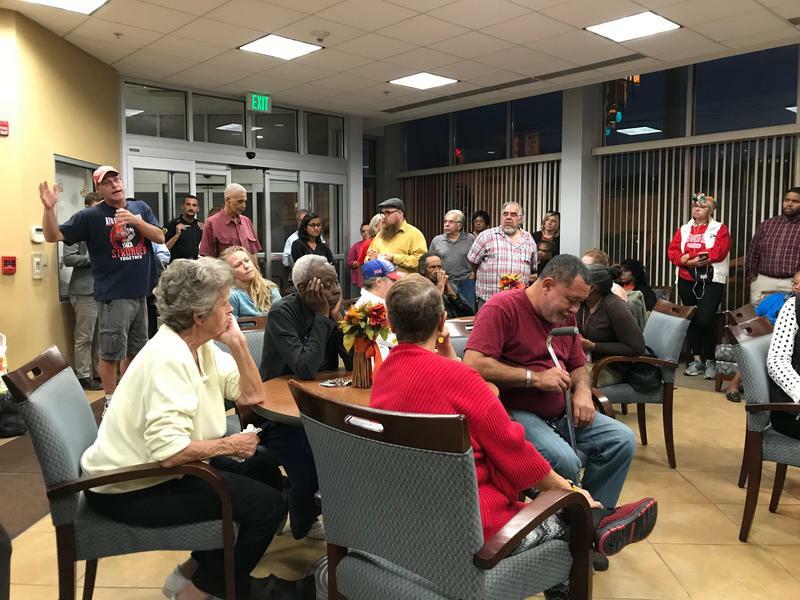 At a Port Authority meeting held Oct. 2 in Braddock to discuss how BRT would affect the community, residents said an extension of the East Busway would allow Braddock to share in Pittsburgh’s increasing pace of development and prosperity. During that meeting, Braddock Council President Tina Doose questioned why extending the Martin Luther King, Jr. East Busway wasn’t advanced in tandem with development of the BRT proposal. “If you want to look at us growing our communities and doing better throughout the Mon Valley, Braddock, East Pittsburgh, what have you, expand that busway,” Doose said at that meeting. Also at that meeting, Port Authority officials said a study examining the plan’s feasibility would be available soon. Doose did not return a request for comment on Wednesday. The proposed Bus Rapid Transit project, for which city and Port Authority officials are currently seeking federal funding, is expected to cost $200 million. While the project would cut travel times to the city’s core, the communities of Braddock, Duquesne, and McKeesport are expected to lose roughly half of their service. The last extension of the East Busway was completed in 2003, from Wilkinsburg to Swissvale, and cost $68 million. The East Busway began operations in 1983, and cost $115 million to build.